RORATE CÆLI: LEPANTO! "The highest moment that the centuries ever witnessed." "The highest moment that the centuries ever witnessed." We cannot but recall that four great Roman Pontiffs came from the Dominican ranks. Of these, the last, St. Pius V, won undying gratitude from Christianity and civil society. 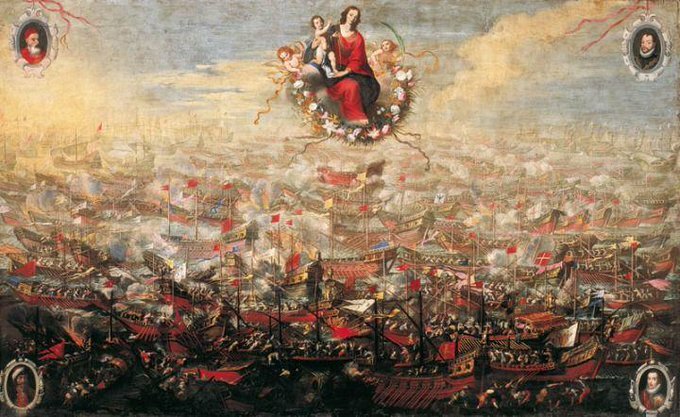 He joined together, after unceasing efforts, the arms of the Catholic princes, and under the patronage of the Virgin Mother of God, whom, therefore, he ordered to be saluted in future as Help to Christians, destroyed forever at Lepanto the power of the Turks. In this is amply shown the third quality We have noted in Dominican preaching: a most zealous piety towards the Mother of God. It is said that the Pontiff knew by Divine revelation of the victory of Lepanto achieved at that very moment when through the Catholic world the pious sodalities of the Holy Rosary implored the aid of Mary in that formula initiated by the Founder of the Friar Preachers and diffused far and wide by his followers. How pleased was the Heavenly Queen with her pious servant may be easily gathered from this, that she used his ministry to teach the Most Holy Rosary to the Church, the Spouse of her Son; that prayer which, being both vocal and mental, in the contemplation especially of the mysteries of religion, while the Lord’s Prayer is fifteen times repeated together with as many decades of the Hail Mary, is most adapted to fostering widely piety and every virtue. Rightly, then, did Dominic order his followers, in preaching to the people, to inculcate frequently this manner of prayer, the utility of which he had experienced. He knew, on the one hand, Mary’s authority with her Son to be such that whatever graces he confers on men she has their distribution and apportionment. On the other hand, he knew that she is of a nature so kind and merciful that, seeing that it is her custom to succor the miserable of her own accord, it is impossible she should refuse the petitions of those who pray to her. Accordingly the Church, which is wont to salute her “the Mother of Grace and the Mother of Mercy,” has so found her always, but especially in answer to the Rosary.